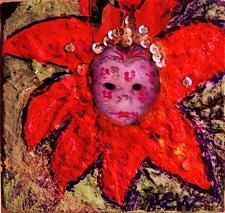 Mardi Gras Mask Girl II is a mixed media by Anne-Elizabeth Whiteway which was uploaded on January 15th, 2010. Mardi Gras Mask (Girl) is one of my favorites. It is 5 by 5 inches and almost 2 inches deep on boxed canvas. The original is still for sale. Spending New Year's in Nola! Love your expression regarding Mardi Gras, and so far, think it applies to this eve as well. Happy New Year!